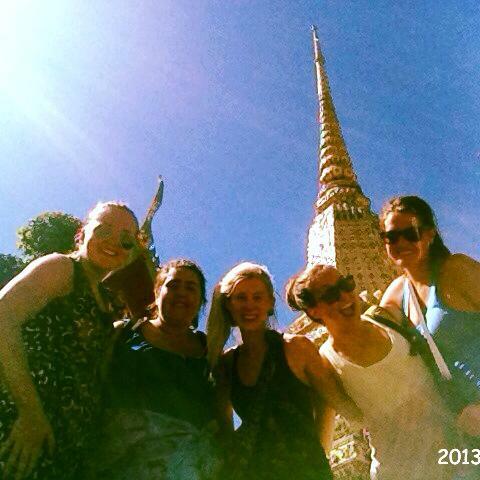 Last week we were in the incredible city of Chiang Mai. As soon as the songtaow rolled up to our hostel, the entire team was gasping at the unparalleled beauty of…. the pool. That’s right, never before have you felt the joy that comes along with finding out that after two weeks of a perma-sticky, salty, first-date clammy, sweaty-daze you will get blessed with the divinity of a cool swimming pool (available for use 8am-8pm, please: no shoes, shower before entering) – Oh glorious day! After swimming like it was our day job to hinder our back-sweat (or swack as Ryan so affectionately coined) we wandered the streets and looked through tons of used book shops, dress stalls, and shaded markets. Ryan and Sarah informed us that were we were being taken out for a special dinner – because we survived the jungle – and should get a little dressed up. We scoured the city and found outfits. Paired with our first round of makeup since arriving in Southeast Asia we actually looked cute. The group enjoyed a nice Italian dinner in a Thai garden terrace! Yay for culinary options after lots of yummy rice and veggies. We had three days to rent bikes and race around the moat, drink fresh smoothies, swim in the pool, dance a night (or two) away and explore one of Chiang Mai’s most visited temples, Doi Suthep, and one of its quieter Buddhist sanctuaries, Wat Umong, Both beautiful, one covered in gold on top of a mountain, and the other nestled in the forest outside a university campus. On our second night in the city we were invited to Ryan’s (Thai) mother’s home to learn the art of Muay Thai boxing from some of Chiang Mai’s most successful fighters, and – in very Thai style – eat an amazing meal with them. We stood on mats and practiced uncoordinated kicks and punches to the punching bag before being taken into the big ring. The boxer’s spoke a little English, and our Thai consisted of hello, thank you, and no problem, so we learned mostly by watching and imitating. They were very patient with us, as we continued to send punches and kicks their way. On more than one occasion, I kicked one of the boxers in the chest, and rushed over to help him up, seriously wishing I knew the Thai translation of, “oh my gosh, I’m so sorry. I didn’t mean to, are you alright? !” I assume my concerned face and extended arms got my message across, as he didn’t throw down his blocks and Muay-Thai me to the moon. 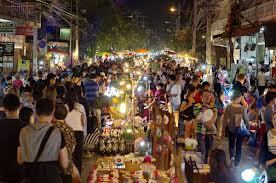 Finally, on our last night we went to the Chiang Mai Saturday night walking street market. This was definitely one of the best markets we’ve been too. It was crazy busy and it was easy to feel like a salmon headed upstream, but if you grabbed a bag of pineapple and just enjoyed the ebb and flow it was no problem at all! To update you on our team Rachel needs a second (maybe a third) bag to carry her souvenirs, Karen’s hair is starting to balance its natural oils, Sam met a girl named Bo and she danced with us all night, Rebecca’s kankles are slowly de-swelling, Victoria is rebalancing her water intake, Erin is keeping us sane, Sarah M. is shoulder-dancing like a boss, Sarah R. is being forced onto the dance floor, Anna is still looking amazing despite the heat, and Ryan is still coping with his 10 girls…somehow. Yours in swack, Becca and the SEA Animal Conservation Team!